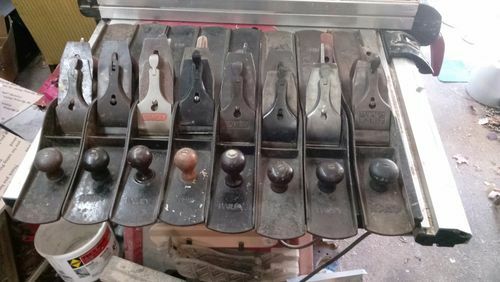 I was looking to get a few hand planes. In general, I prefer old and used over new. I don’t have any local places to purchase from so I am basically stuck using only eBay. I’m sure my question will be hard to answer because of all the factors, but what is a general price range for a used jointer plane #7 or #8? I am purely looking for something that I can use and works and not worried about the brand or appearance. I am also okay with doing some restoration if that is the only way to get it in my budget. Also, if anybody is looking to get rid of a jointer plane for not too bad of a price let me know! #8s are generally more expensive than #7s. If you look carefully, you can probably find a restoration job for ~$50-$75 or so, but the prices tend to fluctuate quite a lot. They’re definitely more expensive now than they were 4-5 years ago. I personally don’t see No. 8 jointers going for less than $80-$100, but that’s likely because I’m not in the Northeast US. If it’s in good to fine condition, expect $150 or more. That’s one reason why many choose (prefer?) 7s. Check out a couple of the LJs that sell planes. Likely more trustworthy and a better deal than eBay. The oft referred one is Time Tested Tools, but there are a couple others too. You might also look at a #6. Many people overlook them for the #7 for jointing, but the reality is that a #6 will serve most people just as well. It’s a few inches shorter, yet more than long enough for most furniture work. I use a #6 size because it’s easier to handle and gives just as good of results as a #7. Added bonus is that #6’s generally sell for about half of what a #7 does. If you want a #7 or 8, go for it, just wanted to present another option. Some like the 7’s better because its a little less weight you have to push around. You can find a tuned 7 for a decent price if your patient. I like the #8s though.. I prefer a 7 because the same iron and chip breker fit my 4-1/2’s. Easy to have spares sharpened up and ready to go. 7 is a bit easier to joint with since it is a bit narrower and easier to balance. I’m a big person with plenty of strength and find a #8 can get unweildy at times. I use an 8 all the time. I’m not constructed like the incredible Hulk and have never understood why people say – go for the 7, you’ll kill yourself with an 8. I’ve never worn myself out. Scratch that – I have worn myself out with a LA jack and toothed blade, reducing a board to thickness. But a jointer? Never. It’s not a thickness planer. The difference between a 7 and 8 in size and weight is marginal. You’re not lifting it in the air, you’re pushing it. More mass helps you plane through anything. Seriously – I wish every single plane I owned had more mass. Including my blocks. Now if you tried a 7 and an 8 over time and said – the 7 just feels better to me, I get that. But it seems to me the 8 is typically written off too fast. Wow, are you looking to offload any of those 8’s? Some like the 7 s better because its a little less weight you have to push around. You can find a tuned 7 for a decent price if your patient. I like the #8s though..